"What does a bobblehead have to do with a literary estate?" asks Albert Einstein's granddaughter. (CNN) -- Albert Einstein made many contributions to modern science, but it's the videos, bobblehead dolls and Halloween masks using his image that continue to generate millions of dollars long after his death. But his granddaughter, Evelyn, said she hasn't received a dime from the marketing and sales of Einstein merchandise, while others have profited. "What does a bobblehead have to do with a literary estate?" asked Evelyn Einstein, who said she has been ignored by the university in her requests for an arrangement that would allow her to profit from the sales. The school responded in a statement saying, "Einstein left all of his intellectual property, encompassing his literary estate and personal papers, to the Hebrew University, including the rights to the use of his image." The statement added that "the income of the university from the use of his image is dedicated to scientific research." Greenlight spokesman Dan Perlet said the company requires strict guidelines for the dozens of annual requests to license the Einstein name -- including Disney and Baby Einstein -- asking whether the companies seek to promote the scientists' values, intellectual curiosity and innovation. 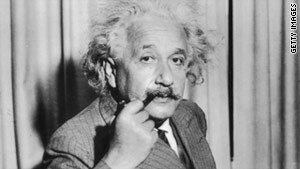 Einstein, known for his wry sense of humor when he was alive, is paid homage with an animated television show called "Little Einsteins," long after his death. The famed physicist was crowned Time magazine's person of the century in 1999, where he was described as "the pre-eminent scientist in a century dominated by science."